TORONTO – Donald “Cowboy” Cerrone has long been a fan favorite for his “any time, any where” attitude to fighting. So when his fight with Kelvin Gastelum at UFC 205 was scrapped because of a weight cutting issue for Gastelum, Cerrone was clearly disappointed. But UFC listened to Cerrone and got him quickly scheduled for a fight at their next pay-per-view: UFC 206. CBSSports.com’s Brandon Wise reports that Cerrone was paired with Matt Brown, pinning two octagon veterans together, and neither disappointed. The two fighters brawled for three rounds with each scoring knockdowns of the other before “Cowboy” finally dropped Brown for good with an absolutely brutal headkick. This picture from MMAFighting sums it up. What a damn fight and finish by @Cowboycerrone! Since moving up from lightweight to welterweight, Cerrone is now 4-0 with all four wins coming via stoppage. It’s crazy to think that Cerrone was just as good at 155 pounds as he’s been at 170 when his only significant losses at lightweight came at the hands of Rafael dos Anjos. In fact, since losing to dos Anjos the first time, Cerrone is 12-1 with the lone loss coming in the lightweight title fight. Safe to say, Cerrone is quickly moving up those 170-pound fighter rankings. The bouts ware the first for Cerrone since stepping forward last week as two of the five high-profile fighters serving as the face of the Mixed Martial Arts Athletes Association. Meanwhile, Max Holloway has his belt, and now he’s going on the hunt. The garrulous Hawaiian scored a knockout over Anthony Pettis 4:50 into the third round for the interim featherweight championship in the co-main event at UFC 206 on Saturday night. It was the first time a UFC belt was on the line for just one fighter. It became an interim featherweight title bout for Holloway when Pettis failed to make weight on Friday, coming in 3 pounds over the 145-pound limit. Pettis was fined 20 percent of his purse as a result. The win sets up a possible showdown for Holloway with official belt-holder Jose Aldo at UFC 208 on Feb. 11. Holloway said UFC President Dana White already offered him the fight following his win over Pettis. Both Aldo and Holloway have lost to former featherweight champ Conor McGregor, but McGregor was stripped of his belt in late November by UFC because he had yet to defend it while fighting in other classes. Aldo was given the belt, but he hasn’t fought since beating Frankie Edgar in July at UFC 200. “I already had to give up Thanksgiving for this fight, I had to give up my birthday and it’s hard to find the guy,” Holloway said. “Like I said, ‘Hashtag: Where’s Jose Waldo.’ Let me know when you find him. During his post-fight interview in the octagon, Pettis said he broke his right hand with his first punch in the first round. Earlier, Cub Swanson won a unanimous decision over Dooho Choi (30-27, 29-28, 30-27) in an entertaining featherweight bout. Emil Meek got the main card started by defeating Lethbridge, Alberta, native Jordan Mein by unanimous decision (29-28) in his UFC debut. Toronto’s Misha Cirkunov forced Nikita Krylov to tap out at 4:38 of the first round with a guillotine choke. Cirkunov improved to 4-0 in UFC and moved into the top 10 at the light heavyweight level. Olivier “The Quebec Kid” Aubin-Mercier was the first Canadian to emerge victorious, defeating Drew Dober in a lightweight bout. The Montreal native forced Dober into submission with rear-naked choke, causing the referee to stop the fight at 2:57 of the second round. In her UFC debut, Viviane Pereira beat Valerie “Trouble” Letourneau of Montreal by split decision (29-28, 28-29, 29-28) in the lone women’s strawweight bout on the card. Letourneau, who fell to 3-3 in UFC, was initially supposed to fight Poliana Botelho, but Botelho was dropped from the card in October. Rustam Khabilov beat Bolton, Ontario, native Jason Saggo by unanimous decision, 30-27, in the first of two lightweight bouts on the evening. John “The Bull” Makdessi didn’t fare much better in the second lightweight bout. 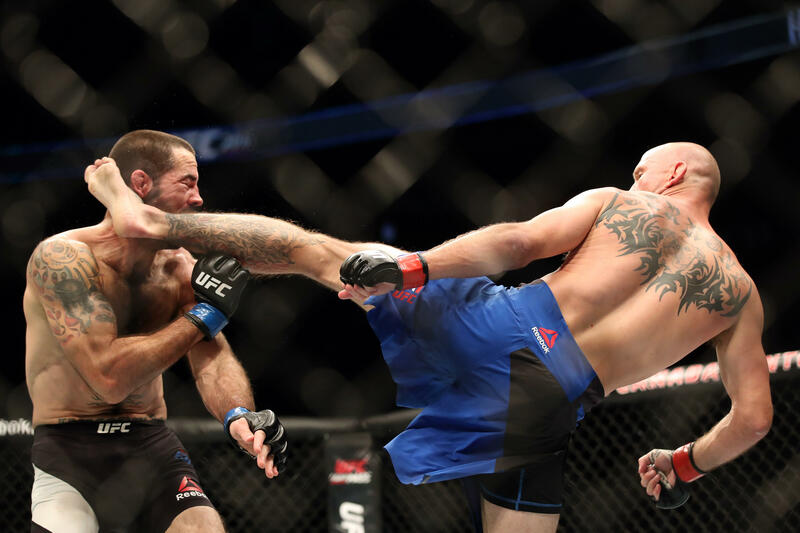 Makdessi, of Montreal, was knocked out by a spinning heel kick to the chin from Lando Vannata. In a bantamweight bout, Mitch Gagnon of Sudbury, Ontario, fell to Matthew Lopez in a unanimous decision (29-28, 29-28, 29-27).